Automating software engineering activities for developing safety-critical systems reliably and correctly brings along the challenge to combine expressive specification methods with powerful analysis techniques. The focus of this paper lies in the analysis of graph transformation systems by analysis techniques transferred from Petri nets. 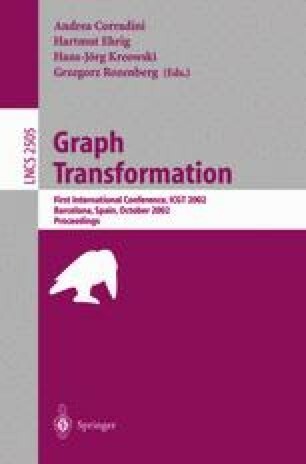 Since Petri nets are famous for their powerful analysis techniques we have started to transfer several notions from Petri nets to graph transformation systems. Especially, invariants provide vast possibilities for analysing a model. Hence, we have transferred transition invariants to rule invariants in graph transformation systems. This allows a suitable analysis of graph transformation systems as is exemplified by a safety-critical system specification in the area of human-computer interaction. J. Padberg and B. E. Enders. Rule Invariants in Graph Transformation Systems for Analyzing Safety-Critical Systems. Internal report, http://www.informatik.uni-essen.de/enders/Papers/textframe.html, 2001.